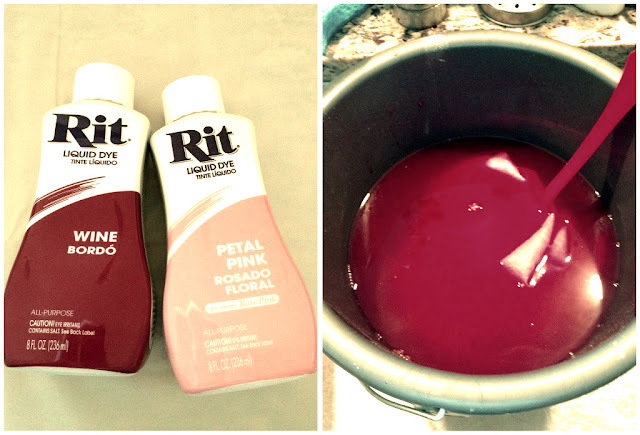 Prim and Propah: Are You Dye-ing to DIY? So I recently made a list on Skinnyscoop (which by the way, you should most def check out) about sprucing up your wardrobe without spending tons of money. 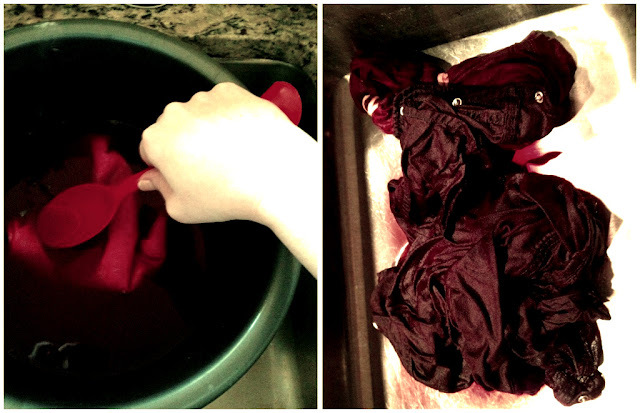 One of my tips was to drop some of your stained or dull clothes into a dye bath, basically breathing new life into said clothes. I got some feedback via the list itself, Twitter and the blog post. The general consensus was what a great idea it was, but that people assume that it's hard. I am here to show you how cheap and easy it really is. What you will need: a bucket ( I grabbed mine for a $1 at Rite Aid), a package of dye (my preferred brand is RIT Dye which runs around $2-$3 a package or $4-$5 for the bottle at Walmart or Craft stores), HOT water (presumably fairly inexpensive), a stirring spoon that is strictly for crafting, and somewhere to rinse the dye-ables. Simple, right? For this example, I grabbed something out of my "needs work" pile. This here chambray shirt was a find from the now defunct Martin+Osa. I was extremely upset when someone put this shirt in the wash with "reds". The back wasn't exactly destroyed but it wasn't totally chambray-y anymore. In one wash, it went from being in my regular rotation to being a chore shirt, which bummed me out. Fast forward to last week when someone pointed out to me that Martin+Osa goods were on Wholesale101.com. I got a replacement chambray shirt for $10. Now I had permission (from myself) to do something with chambray #1. So I went with RED ( or Wine in this example). The instructions on the RIT packaging is very user friendly. It explains exactly how to do a dye bath the proper way with a couple different options. I have been very afraid of doing the "dye through the washing machine" option so always resort to the bucket or the sink. So far, I have been very please with how my dye-ables always come out (please note: In the past, I have had to throw some items in a second dye bath for personal desired results). My favorite location to set up dye camp is in my stainless steel kitchen sink. It is important to always be aware that you are using dye and it is created with one purpose, to stain things. I have learned the hard way what happens when you are careless. Once you have you dye bath set up according to the directions, I cannot stress enough the importance of consistently stirring the fabrics in the dye. If you do not keep stirring, pockets will form where dye will not saturate evenly and you may end up with undesired spots where the original colors come through. If your desired affect is for hippie tie dye? Then I guess you don't have to listen to me on this one. As far as rinsing is concerned? No matter how you dyed it, you want to rinse, rinse, rinse and just when you think you are done rinsing, you rinse some more. 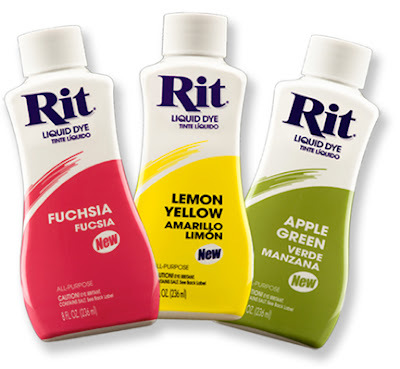 Even though you should be washing this separately from other items, I have still had accidents which left other items in need of a dye bath too. Just rinse again, trust me. I always wash my dye-ables with a load of black towels and then run the machine once these items are in the dryer. It's just my way of making sure any of the remnants of color is gone before we do real laundry in that washing machine. My man would be none too happy if I left his button downs a tad discolored. While I was Dyeing, I decided to a batch of blacks as well (although completely separate from the wine colored batch). I had a pair of The Limited skinnies that fit so well but have just faded in the past few months. The same goes for a Martin+Osa cardigan that I have had for years. I wanted a rich black back to breath new life into them. Just like with the chambray shirt, the pants and cardigan were almost like new (although obviously worn). You can make a day of it and breathe new life into your wardrobe. Am I right? What do you guys think? 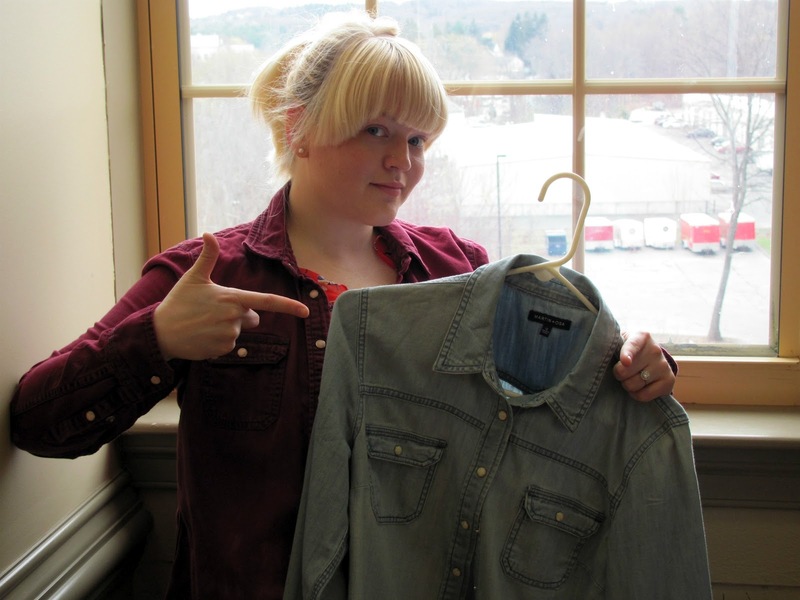 Is this a quick way to add a splash to your old, seemingly unwearable items? Or is it just too much work? love it! Rit also makes a "color run remover". It was a lifesaver when a wet batingsuit in my luggage leaked onto some dark denim, that stained some khakis. You just gave me a great idea for some old white tees that aren't so white anymore! I'd love to give it a go but I'm way to nervous! ooo thanks for the quick tutorial! I have a couple of tank tops that could use a little sprucing up this summer. I never even thought of dyeing black to breathe new life into it, brilliant! Oh girl, just experiment with something that can be spared... you would be surprised how cool stuff comes out!